One of the biggest chinks in our food independence is grain. We grow sweet corn and could grow field corn though our consumption of corn meal is so low that the latter doesn't seem like a good use of space. But we also buy masses of wheat flour and rolled oats every year, along with some rice. Can we become less dependent on commercial supplies of grain? Maybe I should splurge and buy some of the grain to eat first to see if we like them, but I've heard they're both delicious cooked like rice, and that amaranth can also be ground into a flour. Both are higher in protein and lower in carbohydrates than more traditional grains, which can't hurt. Want to be more independent? Check out our ebook about becoming financially independent. When I grew up we called amaranth by another name--pigweed. It grew itself. But why not grow some winter wheat. It isn't that hard to thresh out. Check out how primitive people did it. These early grains weren't that hard to do for your own use. You have a near perfect setup for growing rice. Just divert a little water from the creek to the wetlands at the right time. You can find varieties of both Oats and Barley that are without hulls. Look in heirloom seed catalogs for hull-less or naked barley/oats. I believe you still need to do light threshing, but that's much easier than removing hulls. Gene Lodgson I think has a book on small scale grain production that would be worth checking out. I have a book that I've been saving for when we finally get onto the homestead site called "Small-Scale Grain Raising" by Gene Logsdon. I haven't read it yet, but everyone tells me it is THE book for this sort of thing. If you haven't already, perhaps you could check the library for it. Daddy --- I wanted to grow rice, but then learned that rice needs extremely long warm seasons. China is much closer to tropical than we are, and I suspect our growing season just isn't long enough here in the mountains. The internet suggests that you might get away with growing rice in South Carolina, but that Florida or Texas is most likely. Sena and Everett --- I ran across Gene Logsdon's book while researching this post and I agree it looks awesome! I just put in my request on interlibrary loan. Sena --- I didn't know there were oats and barley varieties without hulls! That would make it so much easier! I was intrigued by your thoughts and looked in Wikipedia. They both sound promising until you get to "Amaranth" and scroll down to "As A Weed". If you pick the right variety you should have a good food source, but using the wrong variety could prove to be a problem. Since it seems to be well documented you should have no problem picking the best for your area. I wish you well in your search for the best foods. When I was a kid (oh, so many years ago), the moms and grand-moms used to get together and "CAN" the products of their gardens. Are you thinking of this at all for your off the grid life? Makes the winter easier knowing the larder is packed with the bounty of the summer. I'm going to have to do a bit more research and make another post about Amaranth and weediness. My understanding is that the named varieties they sell in seed catalogs are safe, but I could be wrong! We've opted to freeze all of our excess produce rather than can it, mostly because we really prefer the taste but also because frozen food is better for you than canned food. With the generator, our frozen food is safe even during extended power outages (as we found out! ), but if some major disaster took down the entire grid, I probably would move to canning and drying. We've got the canning jars and the know-how just in case! What about buckwheat? It is pretty easy to grown, and only needs light threshing. As a benefit, it is a great nectar source, grows as a ground cover (smothering out weeds) and is not a true grain so it can grow in crappy soil and adds nitrogen to the soil. Buckwheat --- great idea! I wish I hadn't just ordered the last of this year's seeds last night. I'll have to add it to my list of grains to try, though. hobbitprof --- Actually, I was discussing this issue with some readers recently. See the comments on this post. I feel very lied to. Everywhere said it isn't too hard to harvest, but the seeds are so small and light they take forever to separate from the bugs let alone flower parts. The seed blows away nearly as easily as the flower parts, the orange and green parts of the flower. I try eating it but the green flower parts ruin the flavor. Bugs got to the leaves also. It is beautiful when flowering but impossible to get a clean harvest. Anonymous --- Sorry you had trouble! 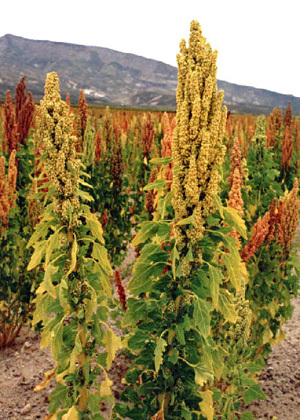 We actually had relatively good luck with our amaranth experiment --- you can read about how we threshed and winnowed. I hope that helps!